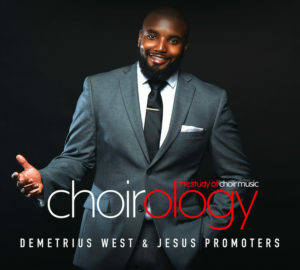 Kerry Douglas’ Black Smoke Music Worldwide label is set to release their newly signed gospel group, Demetrius West & Jesus Promoters label debut and sophomore project ChoirOlogy: The Study of Choir Music (Black Smoke Music/eOne) on Friday, August 10th in-stores and on all digital outlets. Fans can pre-order beginning Friday, July 27th and will receive an instant new grat track every week. From the flatbeds of Indianapolis, IN, Demetrius West & JP’s sophomore effort is led by their current radio single “Open the Floodgates,” which is gaining traction weekly in the Top 40 at gospel radio with early believers such as: WCHB (Detroit, MI); WCAO (Baltimore, MD); WNAP (Philadelphia, PA); WGRI (Cincinatti, OH); WJNI (Charleston, SC); WNOO (Chattanooga, TN); WDJL (Huntsville, AL); WOAD (Jackson, MS); WXVI (Montgomery, AL); WNRR (Augusta, GA); WFLT (Flint, MI); WAAW (Augusta, GA); SOAR Radio. Written and Produced by West, Jeffery Thomas II and Dwight Washington II, “Open the Floodgates” sets the tone for 2018 and will remind it’s listeners that they are under an open Heaven as God continues to manifest the promises He’s made. Since their inception they have been blessed to tour and share the stage with Chris Tomlin, Earnest Pugh, KirkFranklin, Kurt Carr, and Bishop Larry Trotter to name a few. Released on July 6th, “Open the Floodgates” is available now for purchase and streaming (http://smarturl.it/mxy2bp). This entry was posted in Gospel, Reviews and tagged ChoirOlogy: The Study of Choir Music, Demetrius West & Jesus Promoters by Kris Patrick. Bookmark the permalink.